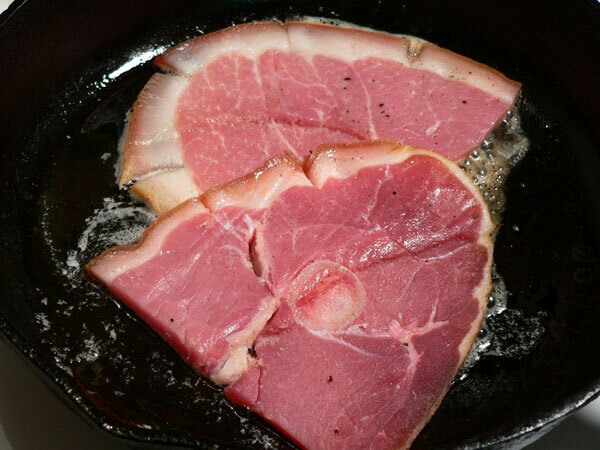 Follow our step-by-step, photo illustrated recipe to make this traditional Southern favorite of Country Ham and Red Eye Gravy. The gravy may be somewhat of an acquired taste, but it’s too easy to make to not give it a try. We’ll fry up the Country Ham, make the gravy and show you how to take breakfast up to another level. Printable recipe included. 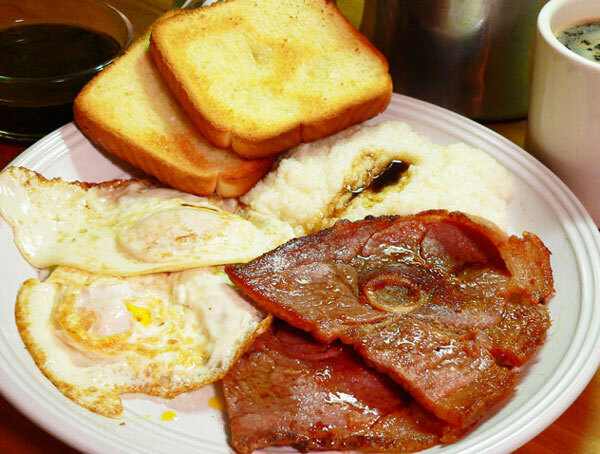 Through the years, many a person has started their day with a breakfast consisting of Country Ham and Red Eye Gravy. Country Ham itself is a cured ham, first mentioned in print back in 1944, and referred to as a method of curing and often times smoking of pork meat. It’s typically very salty. 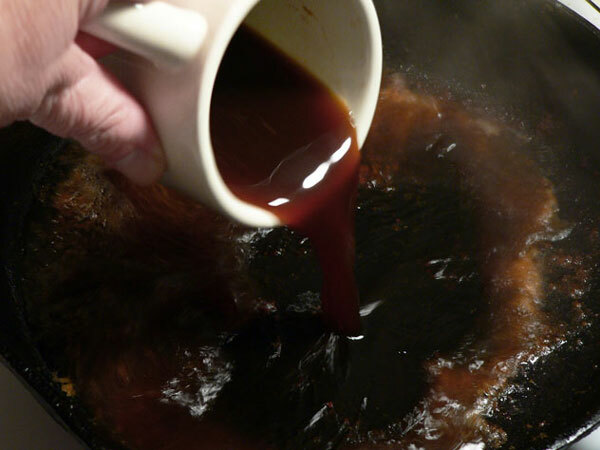 According to the online encyclopedia known as Wikipedia, Red Eye Gravy is mostly associated with the Southern United States and is made from the pan drippings left from cooking country ham, or bacon, and is normally made using black coffee to deglaze the pan. The name itself comes from the appearance of the gravy once it’s been placed in a serving bowl. 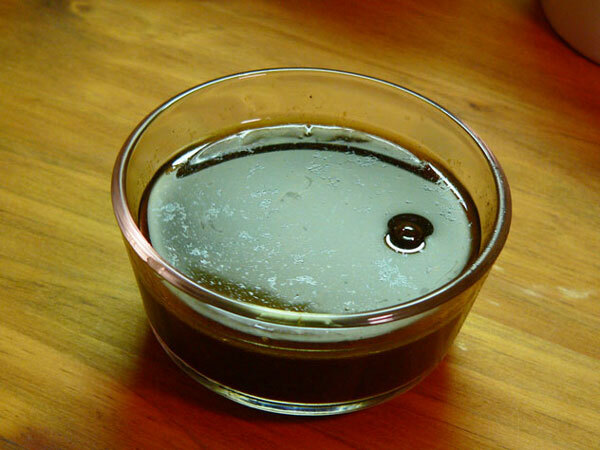 The dark coffee and meat bits sink to the bottom, a layer of grease is usually visible on top, and the result gives the appearance of a human eye. And, so ends our History lesson for the day. The December issue of Our State Magazine contained an article about Henry West down in Duplin County here in North Carolina, and told about his Westwater Country Hams. It’s an interesting read and brought back lots of memories from my childhood as I watched my dad rub salt all over a ham or two right after we had killed hogs on Thanksgiving Day. Later, he’d hang them up in an old storage building out back of our house where they would remain for months before we ever had the chance to enjoy their distinct flavor. I’ve been telling my older brother lately, that I’ve recently developed a “hankering” to try and cure a ham myself. I’m not sure where the urge is coming from other than all the cookbooks and stories I’ve been reading over the past few years, and the many stories my brother tells me while we travel the roads of North Carolina and beyond delivering his custom built pig cookers. He thinks I’m a bit wacky, but he’s offered his tool shed to let me hang it up in. We’ll see. I do hope you’ll give our Red Eye Gravy recipe a try. If you enjoy Country Ham and ever cook it at home, the gravy is just too quick and simple to not try out at least one time. I’ll be waiting to hear from you in the Comment section below and feel free to share your memories of Country Ham with us as well. So, if you’re ready… Let’s Get Cooking. 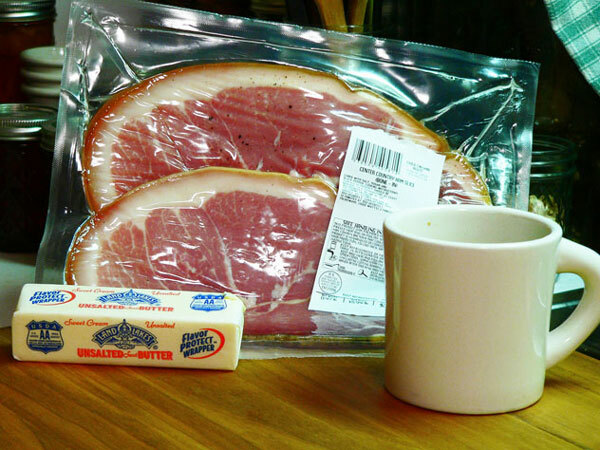 Country Ham and Red Eye Gravy: You’ll need these ingredients. Yep, there’s some coffee in that cup. Most center cut slices of ham are pretty large. It will be easier to fry if you’ll cut the slice in half. 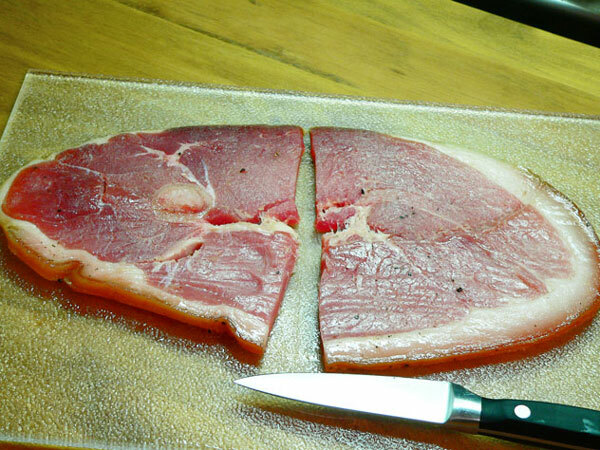 Cut through the layer of fat around the slices about every three inches. This will help keep the ham slice from curling so bad while it cooks. Some folks also like to remove the “rind” or outer skin layer from the ham slice prior to cooking. That’s an option that’s entirely up to you. I left it on this slice. Country Ham is usually very salty. I prefer to soak my slices in water for 30 minutes to an hour to try and reduce some of that salty taste. It’s still going to be pretty salty even after you soak it. Soaking is not required but I highly recommend it. A glass pie dish comes in handy for soaking one or two pieces. Just place the ham in the dish, cover with water, and let sit for for about 30 minutes or longer. Some of the water will also absorb back into the ham and cause it to plump up a bit. Some folks soak in milk, but water will work just fine. When the ham is ready to fry, remove it from the water and pat it dry with some paper towels. Then, place your skillet over medium heat on your stove top. 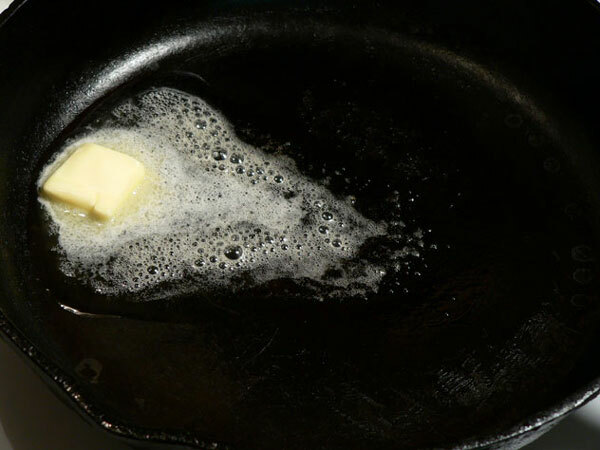 When the pan gets hot, drop in about one Tablespoon of Butter. 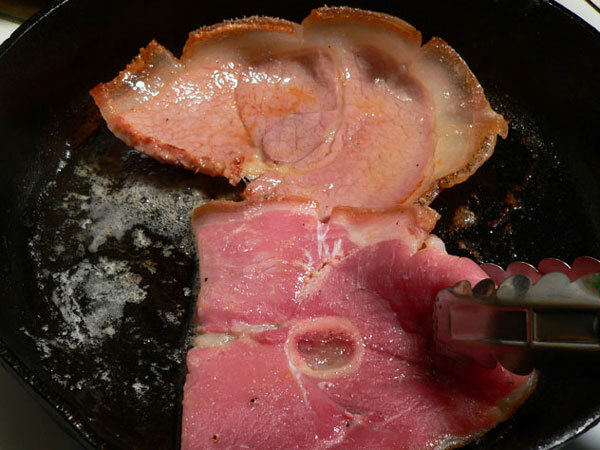 Place the ham in the skillet. 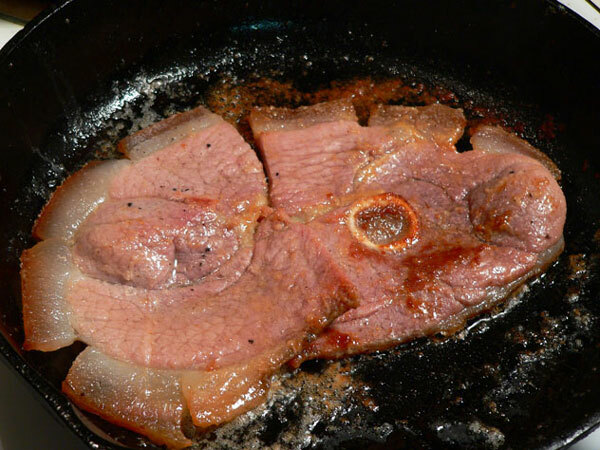 As you can see, this is one slice of ham and it fills up my 10 inch skillet. Country Ham will cook pretty quick. 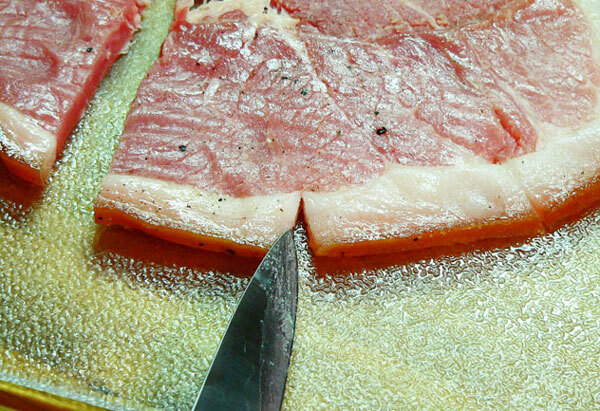 Turn it after about two minutes and let it cook until the fat around the edge is translucent. Do not overcook the ham, it can get really tough and dry if you do. Most folks that don’t like Country Ham have probably only had ham that was over cooked. Having said that, my late wife would order a ham biscuit at a drive-thru and tell them she wanted the hardest, dryest piece of ham they had. If they didn’t have one, she’d ask that they “burn it” for her. To each his own… right? Just cook it until you get it the way you like it. When it’s ready, remove it from the pan. Don’t throw out the good stuff though. 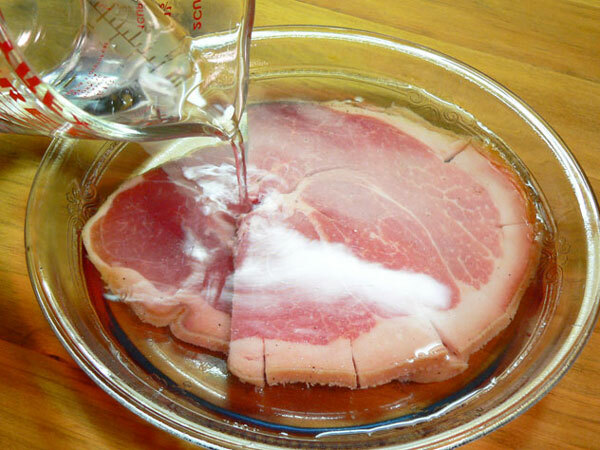 We’re going to use the pan drippings from the cooked ham to make our Red Eye Gravy. You will need about two Tablespoons of the grease. If you have more than that in the pan, pour it out but save all the hard bits and pieces inside the skillet. Place it back on the heat. Pour the cool coffee into the skillet. It will steam up and start to deglaze the pan. 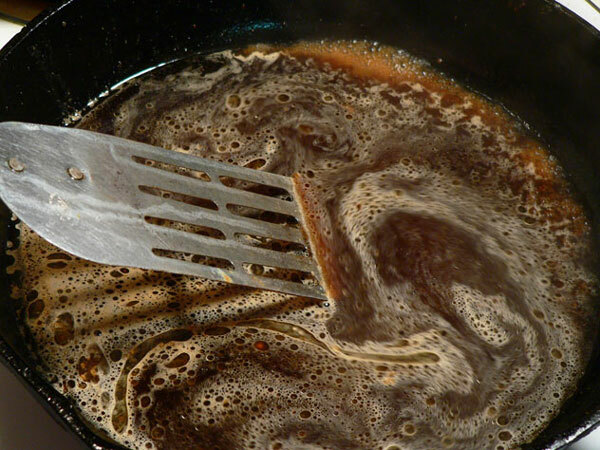 Use a spatula and scrape the bottom of the pan as you stir the liquid. You want to break all the bits and pieces free from the bottom of the skillet. Then, add in the water. I’m using cool tap water, straight from the faucet. Stir that around some more. 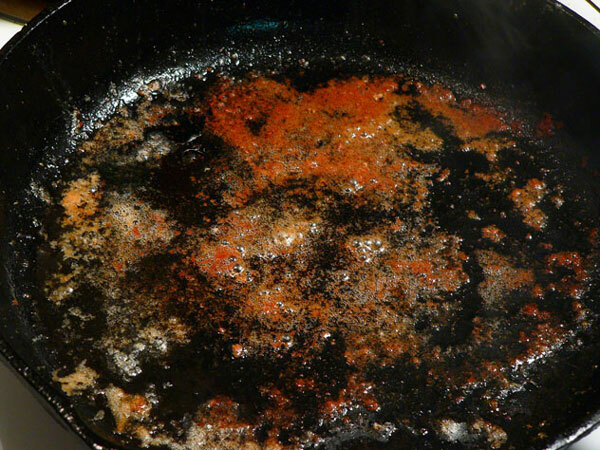 Continue to stir and scrape the bottom of the skillet as you let the liquid come back up to a low boil. Then, reduce the heat and let the gravy simmer and reduce. You’ll need to taste it to see if it needs anything. You could add a little more Salt or maybe some Black Pepper if need be. The gravy needs to reduce down to about half it’s volume and the flavors will become more intense and concentrated in the process. Serve the Red Eye Gravy as a side with your Country Ham slices. Some folks like to dip a biscuit into the gravy and use it as an au jus. It’s great to drizzle over the ham slice itself, or to add a bit of gravy to your cooked grits. You might also like to keep a bit of Jelly handy to help offset the saltiness in the Country Ham, but either way you try it… Enjoy! Your Comments: Have you ever made Red Eye Gravy? I’d love to hear your comments on our recipe in the Comment Section at the bottom of this page. It will only take you a minute or two to share them with us, and if you try our recipe, your comments might encourage someone else to try it. Just know, all Comments are moderated. That means that I personally read each and every one of them before they are approved for posting on our family friendly home here on the Internet. I appreciate you taking the time to share your results with us, and I’ll look forward to hearing from you. Your comments do not appear immediately. I’ll review them and post them just as soon as I can. I also try to respond to as many comments as possible, so be sure to check back in a day or two for that. Thank you in advance. It was easy to make and came out very well. I would do it again. I have never had Red Eye gravy before, but I can’t wait to try. I looked at various recipes and based upon the pictures, ingredients, and instructions, my gut tells me yours is the most authentic. I will let you know how it comes out! I remember as a child in Cincinnati, that my Mom always used Smithfield Hams, and they were so good. I’ve bought some Smithfield Ham over the years but they weren’t anything like the ones we had. Pretty much just hams. Do you have any suggestions about where we might buy real country ham. We live in Southern California but we could have it shipped from anyplace. I tried your Westwater Country Ham but nothing came up. I always enjoy your column and the great recipes you publish. My brother and I talk all the time on our trips about how food just doesn’t taste like it use to. Producers are more concerned with how their fruits and vegetables look than how they taste. The younger generation doesn’t know any better, and that’s kind of sad. Same with things like good old fashioned country ham. Thanks for sharing the country ham and red eye gravy. Christmas isn’t complete without a country ham or two in my family. My grandpa’s favorite, so as a kid, THIS is what we had for Thanksgiving. I have several slices of Clifty Farms country ham in the fridge as we speak. 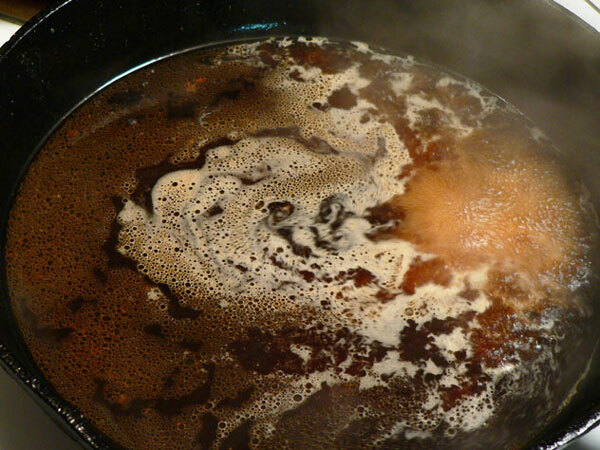 Try frying a slice in part of a can of Coke or apple cider for something different. I’ve made red eye gravy and like to serve it over grits for breakfast. Hi Yvonne, Thank you for sharing your memories of Ham and Red Eye Gravy with us. It’s always good to hear about other families traditions. I’m thankful you found Taste of Southern, and thank you for the suggestion about using the Coke or Apple Cider. Sounds good to me. I just found your website a couple of weeks ago and have been enjoying it greatly. I grew up in the South (central GA) and am familiar with most of the food you present. That said, I’ve never learned how to make red-eye gravy. My mom (and grandmothers on both sides of my family) always made this whenever country ham was around. I’ve tried it a couple of times but it never comes out the same. I look forward to trying this with some grits soon – Thanks for keeping the Southern culture alive! Dinner tonight was this recipe with grits and roasted mustard greens with onion… It all came out perfect! Also all very simple and quick to make. Thanks for your advice and be well! This is just what I have been craving! 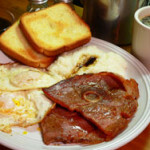 Country ham with biscuits, eggs, & redeye gravy! Thank you so much! This will be next weekend’s breakfast. Or perhaps a wonderful supper this week. I probably need to add some grits to that plate as well. Just found your page and I am really enjoying it. Have a great day! 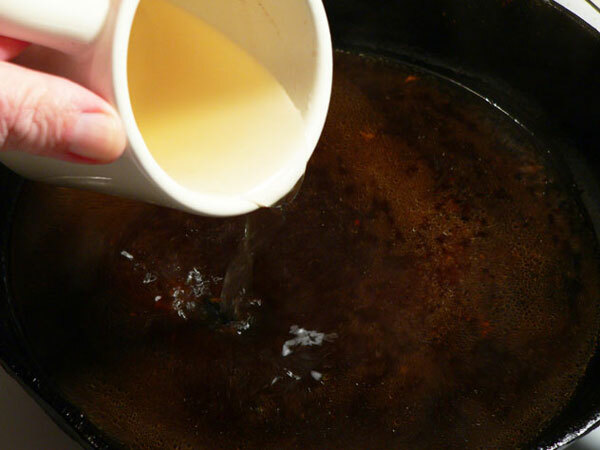 I learned to make red eye gravy from the Hillbilly Hideaway in Walnut Cove, NC They add a little bit of brown sugar to the recipe and it is so much better than just coffee and water. Hi Nancy, Sugar just seems to make everything better, doesn’t it? I’m certainly going to try it the next time I make some Red Eye Gravy. I’m not a coffee drinker so I’m sure I’ll like adding a little sugar to it. Thank You for the suggestion. One set of grandparents (Spike and Katie) lived in Frog Jump, TN. They had 6 children and farmed quite a bit. Grandma would cook breakfast every morning which usually consisted of country ham, sliced tomatoes, biscuits, and red eye gravy. When the kids grew up and moved out, Katie would still get up and make breakfast every morning but would only make 3 biscuits from scratch to go with the ham, tomatoes and gravy for her and Spike. Hi Paula, Thank you for sharing the story about your Grandparents. I’ve never heard of Frog Jump, TN, but I do love the sound of it. Wonder how it got it’s name? Sure sounds yummy but since I quit consuming caffeine, I have to leave off the red eye gravy.